Charlie and Lois O’Brien perfectly fit the definition of “love bugs.” They’ve been married for 55 years, have travelled the world together and work in the same field: entomology. So bugs are their business, and their business has been extraordinarily successful. 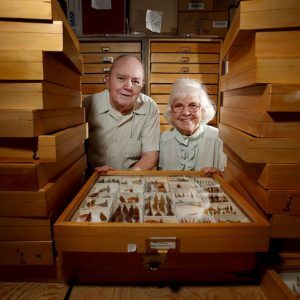 Now in their 80s, the two have collected over one million unique bugs in a collection currently valued at $10 million. Watch this sweet video about their lives together Here. And to read about their enormous generosity to Arizona State University, to which their collection has been donated, Click Here.